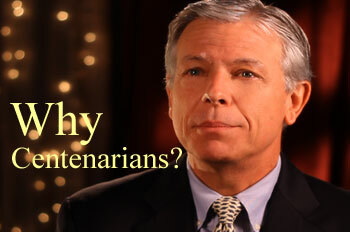 In 2007 Dr. Steve Franklin set out "To capture the Wisdom of America's Centenarians and share it with The Younger Generation." He and his research team have combined videotaped, interviewed and surveyed over 500 Centenarians all across the United States. They include at the time of videotaping The World's Oldest Person (Besse Cooper 116+), The World's Oldest Man (Walter Breuning 114+), The World's Oldest Physician, Lawyer, Girl Scout, Sailor, Water Skier and Table Tennis Champion. These very special people were born in 30 different states and 13 foreign countries. They come from all walks of life and socioeconomic strata, constituting a beautiful reflection of the rich diversity and heritage of our great nation. Dr. Franklin's recently published book Celebrate 100: Centenarian Secrets to Success in Business and Life, published by Wiley, is the distilled essence of over 50,000 combined years of wisdom, wit, insight, perspective and advice about managing money, work and life. These 500+ Centenarians have lived it with determination, resolve and excellence. They have "been there, done that, got the tee shirt and are still wearing it!" Following recent appearances on national television and radio shows, Celebrate 100 ascended to Amazon's #6 Business Book, #9 Biography and History Book, #12 Personal Finance Book. He continues videotaping Centenarians to develop the richest source of Centenarian Wisdom, wit and advice about money, work and life, and share it with Younger Generations throughout the world. Dr. Franklin INVITES YOU to join him in this exciting adventure. Explore his website. Watch them. Listen to them. Learn from them. Laugh with them. And you will live life - and you will love life - longer and stronger. Authentic Wisdom from our Centenarians Photo Gallery The faces behind the Wisdom.